An old stone home is a reflection of its builder’s heritage and masonry skills as well as the region in which it was built. 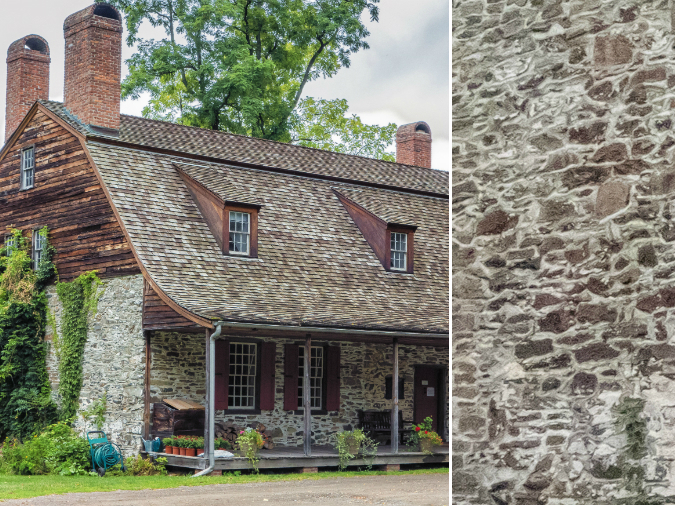 Let’s explore materials and home style as we tour the earliest stone homes to appear along or near the East Coast of North America. In the mid-1600s, the population of New England was primarily English, so home styles were pretty simple, stripped of ornamentation and timber-framed (timber being the most readily available material). Design had purpose: A pitched roof shed heavy snow loads and a central fireplace kept the home warm and cozy during cold New England winters. But not many stone homes. Why? 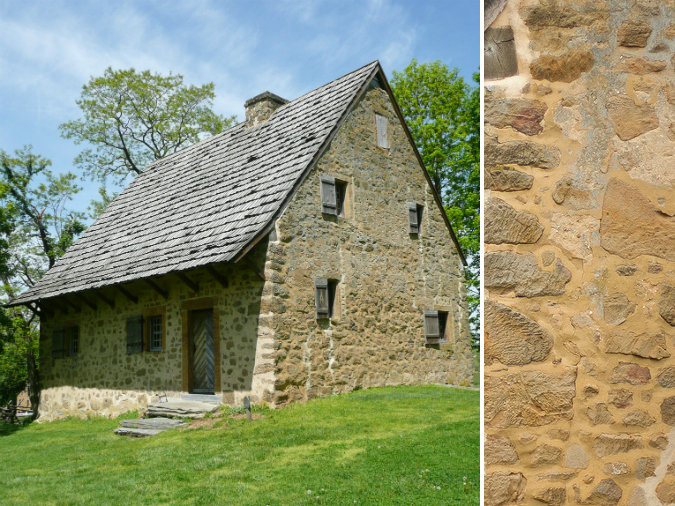 Although fieldstone was plentiful (we know this by virtue of old dry-stacked stone walls that still exist throughout the region), the ingredients to make a good mortar were scarce. Rare examples appear where limestone was plentiful (primarily Rhode Island and southern Massachusetts) and took the form of what came to be coined “stone-siders”. Moving on to the Hudson Valley, we see a slight change in style and construction. 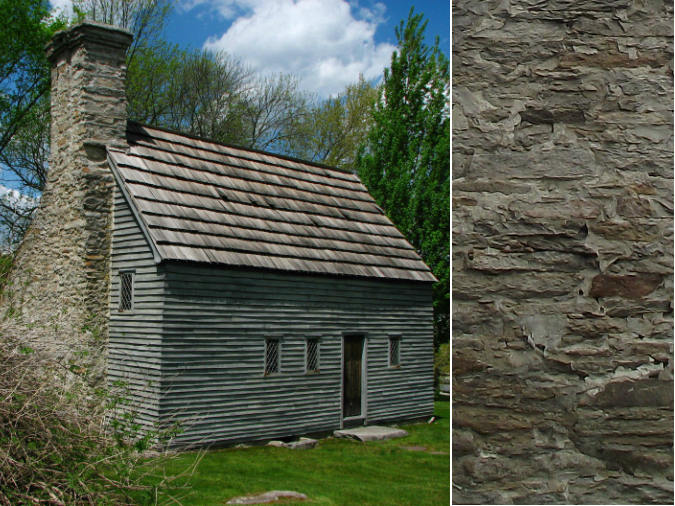 Dutch and Flemish settlers were more skilled in pairing materials, specifically fieldstone with brick, timber or both. To construct the earliest stone homes, settlers rough-cut stone and sandwiched it between layers of hair- or straw-bound clay to build walls that measured up to three feet thick. Lime mortar, fashioned from oyster shells or lime deposits, and finely masoned stones and intricately laid brickwork eventually replaced more primitive building materials. Further south in the Delaware Valley of Pennsylvania, Swedish, Scots-Irish and German settlers initially built log structures. It was the German immigrants who truly put their stamp on the stone home design. The earliest structures featured steep roofs, central fireplaces and small square windows flush set against thick stone walls. Often, homes were built over springs that provided running water or into hillsides (hence the term “bank house”) that kept interiors cool during hot and humid summer months.